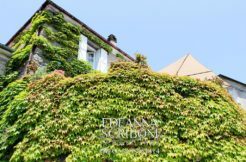 Edeanna proposes a beautiful villa for sale. 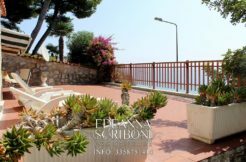 The property lays on the first hill of ‘Pinamare’, above the picturesque port of Andora in western Liguria. The house for sale is surrounded by a beautiful garden, which can also accommodate a nice pool. A large panoramic terrace provides access to the house, and from here you can enjoy a breathtaking view of the gulf. The living area has a large and bright living room with a fireplace and large windows and kitchen. The sleeping area has three double bedrooms and a bathroom. The villa for sale also offers the exciting opportunity to convert the attic into living space. In this way, you get an attic room with a large bedroom suitable for a double bed, comfortable walk-in closet wardrobes, private bathroom and a terrace overlooking the sea. 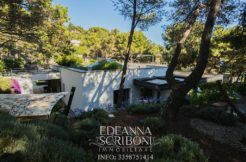 The view from this location is enchanting, and the surrounding garden is designed with palm trees and evergreen trees so that the outdoor area is both protected from external looks and also offers pleasant, quiet places. The property for sale also consists of a garage on the ground floor, a cellar and laundry, a total of 180 sqm commercial area. The price requested for this property follows the current estate market situation. 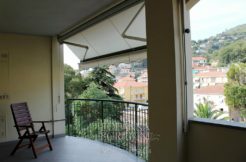 Three-room apartment for sale in liguria, near to the beach Wonderful apartment complex overlooking the sea with a large balcony.